Commissioner Chloe Eudaly casts the deciding vote to encourage controversial downtown redevelopment plan. A controversial downtown redevelopment project moved a step forward when the City Council tentatively agreed to substantially raise maximum allowable building height in the RiverPlace area along the west side of the Willamette River on Thursday. The increase from 75 to 325 feet was requested by NBP Capital for an apartment complex that would include nearly 2,000 new apartments, including about 500 that would be affordable to households earning 80 percent of the area's median family income. The council also voted to require the developer to prepare and submit a master plan for the project before it is formally submitted for approval. The project is opposed by nearby residents and others in the recently-formed South Downtown Neighborhood Development Coalition. They argue the towers would create a wall along the river and block views of it that the city has protected in the past. The project will require the demolition of the failed RiverPlace Athletic Club and the relatively low Douglas Place apartments and townhomes. All are owned by NBP Capital on the 10-acre site that would be redeveloped. "This would forever change the face of the river. If the City Council approves it, other developers will seek the same thing," says Phil Gilbertson, a downtown resident who helped form the new group. The project is also controversial because it was introduced late in the council's ongoing process to update the Central City Plan that guides growth in the urban core. 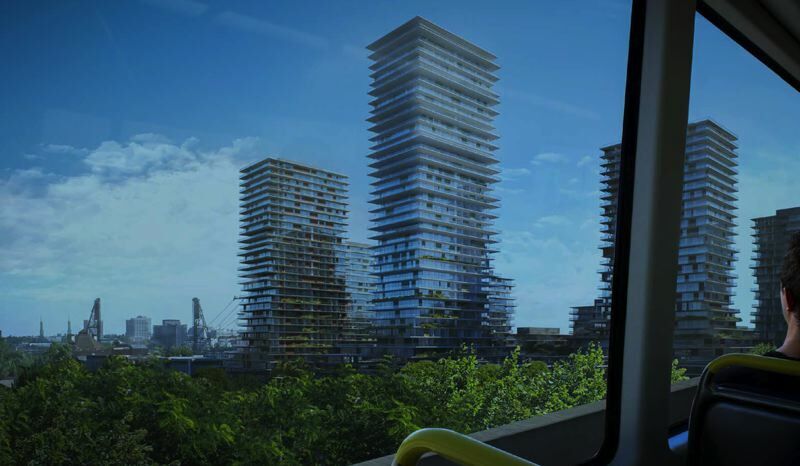 Before the project was presented to the council, the appointed Planning and Sustainability Commission had already recommended an update that only raised the RiverPlace height to 200 feet. Critics, including prominent developer John Russell, accused NBP Capital of intentionally bypassing the commission's public involvement process. The commission advises the Bureau of Planning and Sustainability, which is doing the technical work on the update. "That's outrageous. That's not how proper planning is supposed to work," says Russell, whose company owns the 200 Market Building near the RiverPlace area. Commissioner Chloe Eudaly cast the deciding vote. Two weeks ago, she joined Commissioner Amanda Fritz in voting against the height increase, which was proposed by Mayor Ted Wheeler and supported by Commissioner Nick Fish. It died on a 2-to-2 tie, with Commissioner Dan Saltzman recusing himslef because his family owns property in the area. But Eudaly agreed to reconsider the proposed hight increase after learning more about the project. Among other things, she wanted more assurances the affordable housing units will actually be built. The requirement for a master plan is intended to provide such assurances, in addition to creating of form of the public process that BNP Capital missed. If the apartments are built, a certain percent of their units must be affordable under the Inclusionary Housing policy that took effect on Feb. 1, 2017. Eudaly also disagreed with Fritz that requiring building height to "step-down" near the river was a useful goal. "I don't think our past policies of the last 30 years have resulted in a vibrant waterfront," Eudaly said. The RiverPlace height increase is one of several the council has approved in the downtown area to encourage more redevelop projects, including apartment towers to help house the tends of thousands of additional people expected to be living in Portland by 2035. The council previously voted to increase the maximum building heights in the Broadway Corridor at the west end of the Broadway Bridge a maximum of 400 feet on the northern portion. It has also voted to ncrease heights at the west end of the Morrison Bridge. And it will consider raising them to 200 feet on a block in the Old Town/Chinatown neighborhood on April 4. In addition, on Wednesday the council approved a proposal by Wheeler to give a property tax break to developers who include affordable units in apartment projects submitted for development before the Inclusionary Housing policy took effect. Projects will around 1,900 units were submitted for approval before the deadline. Wheeler said waiving around $100,000 in taxes per unit over 10 years could encourage more than 300 affordable units in thouse projects. The Central City Plan update is intended to be the first amendment to the Comprehensive Plan update approved by the council last year. The council is expected to approve it later this year.